Josephine Sherwood decided to study drama at Radcliffe College because she couldn’t fight the urge to perform. The Newtonville, Massachusetts native began her journey to become one of the greats of the American theater in a stock company in Boston. Hers was not the built of a glamour queen, but when she stepped onto a stage her undeniable presence and brittle delivery rendered her unforgettable. 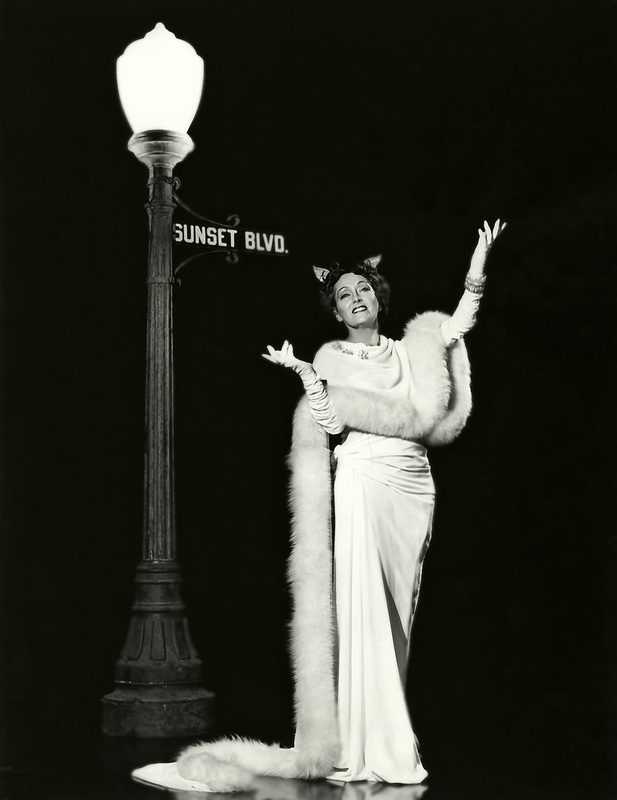 Her Broadway career, which lasted from 1907 through 1955, brought her much acclaim in dramatic roles, but it was her exquisite comedic timing that earns her a spot among the greats. Miss Sherman changed her last name to Hull after marrying stage actor Shelly Hull in 1910. Sadly Mr. Hull died of Spanish influenza at the age of thirty-five at which time Josephine left the stage for three years, but when she returned she did so with renewed energy with the first of her many major hits in 1936 with her portrayal of Penelope Sycamore in “You Can’t Take it With You.” She played the batty Penny for two years on the stage with the role going to Spring Byington in Frank Capra’s popular 1938 film version. 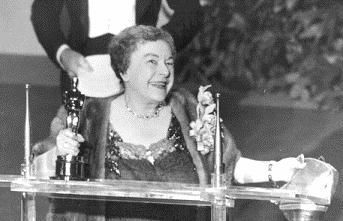 With only thirteen credits in her entire filmography, it was Josephine Hull’s reprisal of the two Broadway roles that followed “You Can’t Take it with You” she is best remembered for. The first is her portrayal of Abby Brewster, one of the two homicidal old ladies in Frank Capra’s 1944 comedy, Arsenic and Old Lace. Hull played Abby on stage from 1941 to 1944 before reprising the role in the film – a great performance. 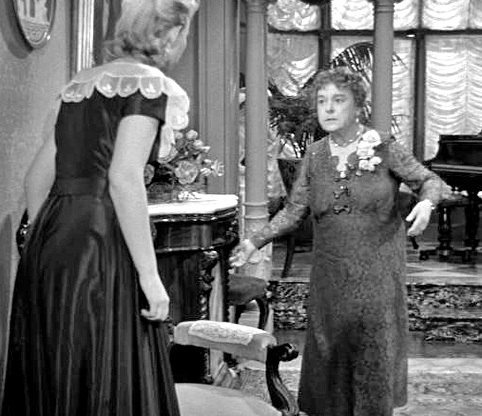 By the way, by the time Josephine starred in the film version of Arsenic and Old Lace she’d been a staple on the Broadway stage for five decades. 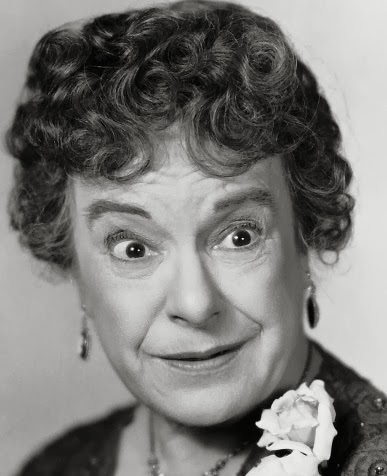 It was in 1950 that Josephine Hull’s reprised the role of Veta Louise Simmons, that one would bring the veteran stage actress her greatest accolades – accolades that include fantastic reviews across the board, huge box office returns and an Academy Award for Best Actress in a Supporting Role for her performance in Henry Koster’s Harvey (1950). 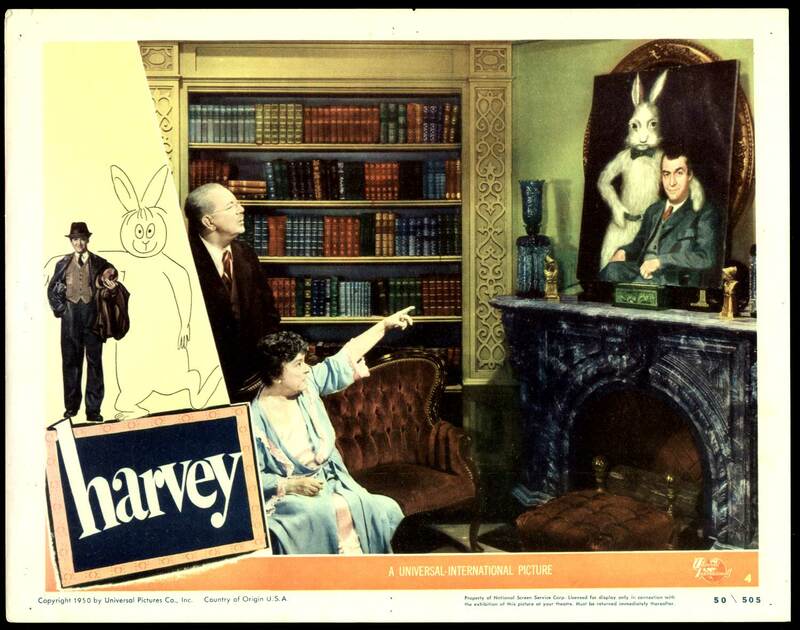 The original Broadway production of “Harvey” by Mary Chase opened on November 1, 1944 at the 48th Street Theatre and ran for 1775 performances – the longest-running show in history to date. The play also won the Pulitzer Prize in Drama in 1945. “P O O K A – Pooka – from old Celtic mythology – a fairy spirit in animal form – always very large. The pooka appears here and there – now and then – to this one and that one – a benign but mischievous creature – very fond of rumpots, crackpots…” and, you get the picture. In this case the pooka takes the shape of a rabbit. 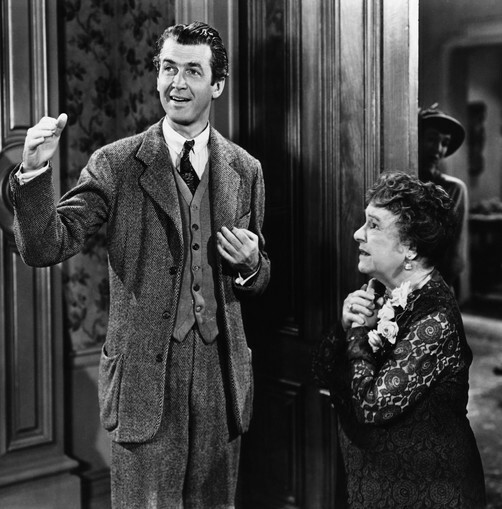 An interesting side note – James Stewart got to play Elwood P. Dowd in Koster’s film – several different actors played the part on stage, all opposite Josephine Hull. Stewart was present at one of the performances and commented during intermission that he’d give anything to play the part in a film version. The show’s producer who happened to be nearby over heard and replied, “What I’d give to have you play Dowd.” James Stewart was signed the next day. To get the rights to the play Universal International Pictures paid the highest price in film history for a single property and decided to use several of the same players that had appeared in the stage production in the film version. Aside from Josephine Hull, Jesse White and Victoria Horne also reprise their stage roles, something not usually done at the time. 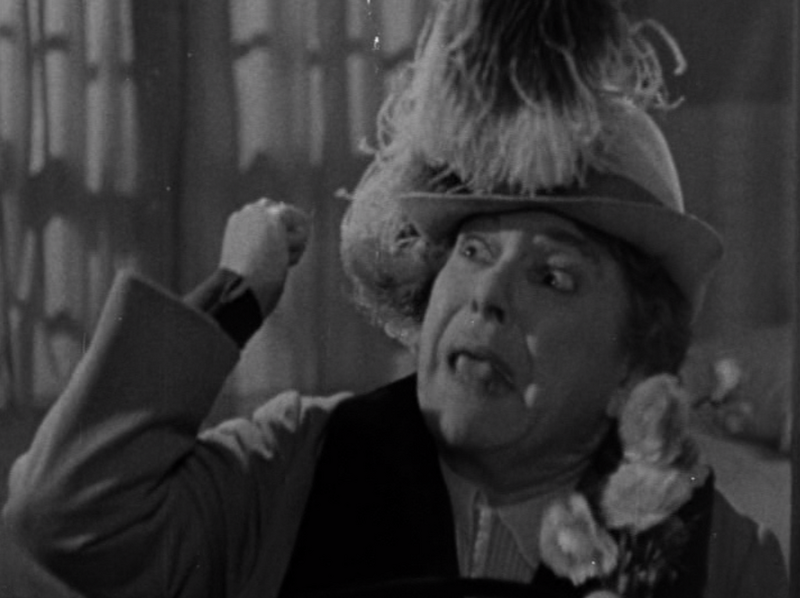 White plays Wilson the heavy at the asylum that has to deal (physically) with all the “crazies” who need to be dealt with and Horne plays Myrtle Mae, Elwood’s niece and daughter of Vita Louise Simmons, Hull’s character. Go here to see a complete cast list. There’s not a loser in the bunch. In any case, as the story goes – Elwood P. Dowd (the kind eccentric) lives in a grand house left to him by his mother, with whom he was very close. He shares the home with his older sister Vita Louise Simmons (Hull) and her daughter, Myrtle Mae. Elwood’s constant companion, Harvey, is the cause of constant consternation and embarrassment for the two women who have all but been shunned by their high society friends and family due to Elwood’s odd behavior. As the story opens the high-strung Veta Louise is in a tizzy because she’s planned a social gathering in the house in hopes of finding a husband for Myrtle Mae who’s not getting any younger. Having invited every who’s who she could think of Veta Louise made plans for Elwood to be distracted long enough for her gathering to go off without a hitch. 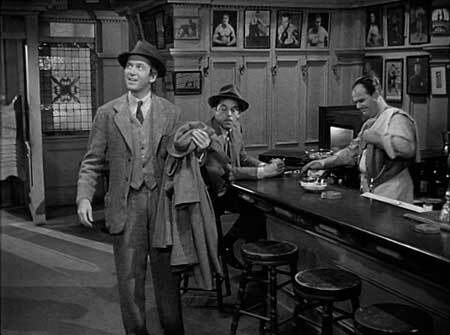 Unfortunately for Veta and Myrtle May, Elwood (with Harvey by his side) visits his favorite, local tavern where he’s told about the gathering almost immediately. Convinced Veta simply forgot to inform him, both Elwood and Harvey return to the mansion to take part in the festivities. As the film progresses and mayhem builds with regards to who actually lacks sense among the characters, we are treated to many wonderful moments of pathos as we learn this is not a simple story about a man and an imaginary rabbit. 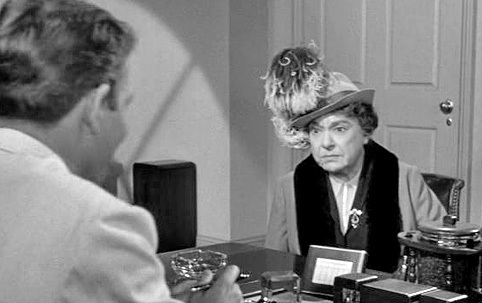 Harvey offers hearty laughs and a hell of a lot of heart thanks in large part to the performance of Josephine Hull who, for my money, makes this film great. 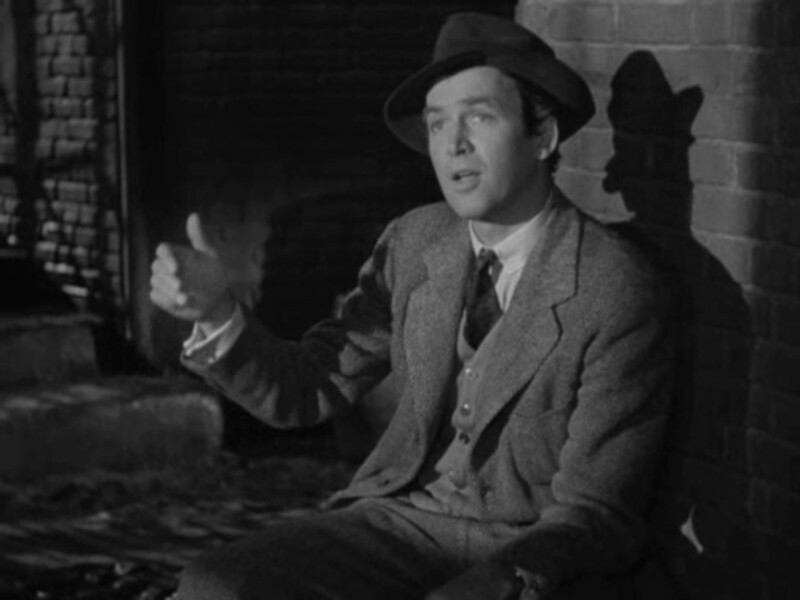 As much as I adore James Stewart the film would not work without Hull’s delivery, timing, reactions – everything I mentioned at the onset of the post. She delivers here a comedic performance for the ages. Josephine Hull utters not one throw away line in the entire movie. Not to mention that her actual physical form – short and stout – adds so much to this picture because of the contrast to that of Stewart’s and Horne’s who are both tall and lanky. I can’t say enough about what Hull does in Harvey – she is hilarious, scatter-brained, confused perfection. And, in this movie, also a perfect example of why so many acting greats have said comedy is much tougher to do than drama. Veta Louise Simmons is not an easy part to play and could have easily gone the way of cookie-cutter hysterical mother roles so we should all be thankful the one actress who’d known the part since the original play’s inception was given the change to bring it to life on screen. It also warms the heart to know the Academy of Motion Picture Arts and Sciences recognized her great work in this film. Also worthy of note is the fact that the character of Veta Louise is the one through which Harvey, the rabbit, becomes believable to the audience. If Veta does not believe in Harvey despite her better judgment neither would we as an audience. I have to say that I always want to yell and do a fist pump when she says that she too sees the rabbit now and again to the doctor before she’s committed. It is the gift of this film that in the end we all want to believe in Harvey and Veta sort of gives us permission to do so – in a way. That’s not to discount the loveliness of Elwood P. Dowd, by the way. Elwood’s strength of character grows throughout the film from what seems as “flightiness” at the start to one of the most perceptive, genuinely kind men in all of film. Or, rather we grow as we come to understand we should have a bit of that flightiness in us. 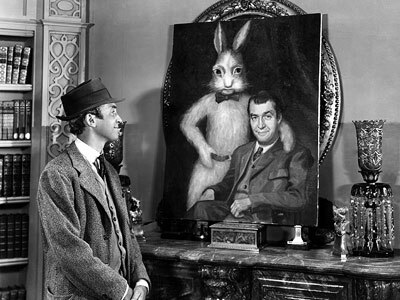 One last thing worth mentioning – director, Henry Koster, recognizing the success of the stage version of Harvey insisted on filming the movie as closely as possible to the stage production. As explained by James Stewart in the DVD commentary, Koster would assemble the cast and rehearse each scene extensively to then film each in single master shots without breaking for close-ups, etc. As a result, the film has the feel of a stage play in many of the key scenes, which greatly enhances the story and the mayhem as we are treated to ensemble scenes rather than individual performances. In essence – and to his credit – Koster played to the strength of his cast. After Harvey Josephine Hull appeared in only one more feature film, Joseph Pevney’s The Lady from Texas (1951) after which she did television work until 1955 when she retired from acting. Ms. Hull died in New York in March 1957 of a brain hemorrhage at the age of 71. She was an American treasure. 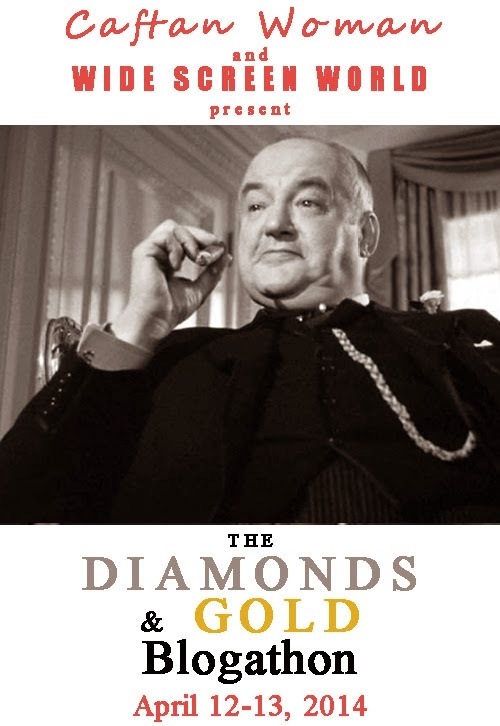 Although I missed the deadline for submission due to technical difficulties, I post this in honor of the Diamonds & Gold Blogathon hosted by two of my favorite bloggers, Paddy aka Caftan Woman and Rich of Wide Screen World. 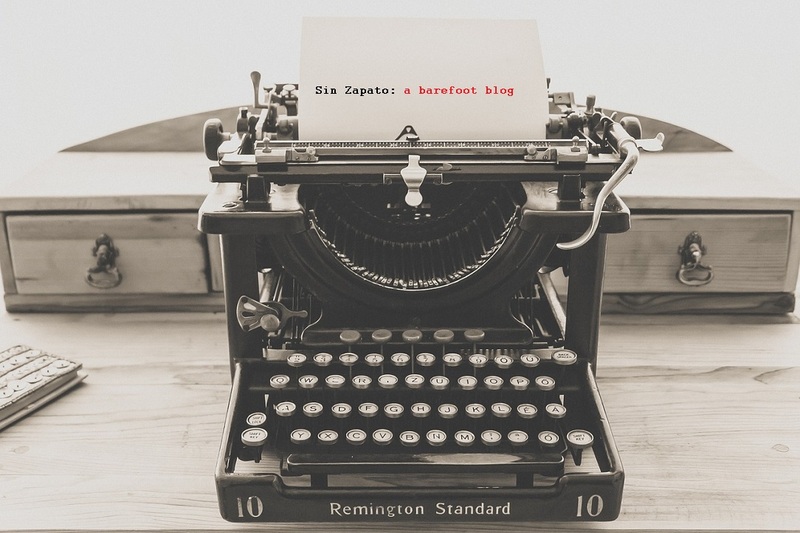 I love the topic of this blogathon and hope you visit both host sites to read about many more actors who “ignored the siren call of social security” to deliver key performances. I also wanted to be sure to give a bit of praise to Josephine Hull and her performance in Harvey, one she delivered when she was 73 years old. G’day I LOVED your post today and this is one of my all-time favorite movies; such that one of my nicknames is Pookie aka pooka! 🙂 Thanks for making me smile and brightening my day! My mom loves Harvey and Josephine Hull. Every time she talks about this movie she tells me, “they don’t have character actors like in that cast anymore.” I’m always like “yes, mom, I know, I know.” She’s right though. Moms have an annoying habit of being right. Lol. They sure do! And yours has exquisite taste to boot! Wonderful tribute to this terrific actress. Thanks for all the info on her background and how Harvey came to the screen. It’s a continuing delight . I wasn’t sure if you’d get this done or not. I’m glad you did. 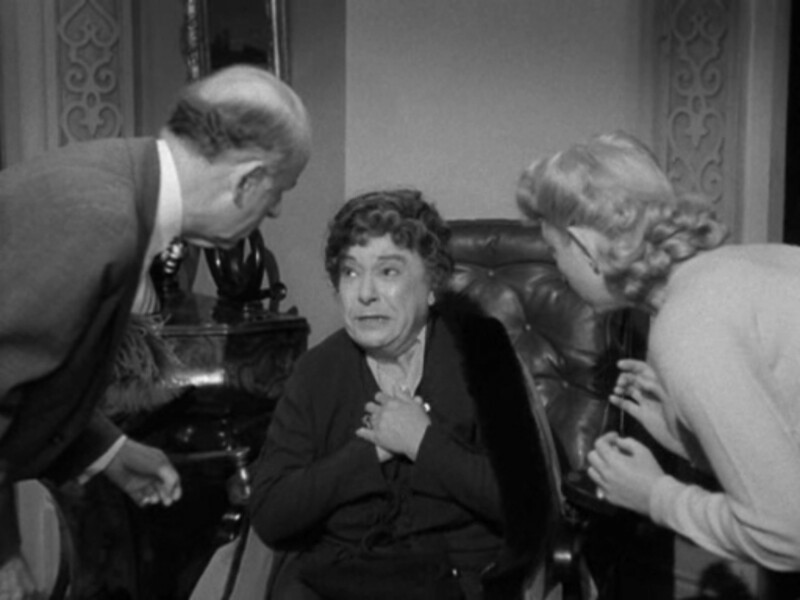 I still haven’t seen HARVEY, but I have seen ARSENIC AND OLD LACE, so I know how funny Josephine Hull was. Thanks for not forgetting us. You must watch this, Rich! I’d never forget you and I’m glad I was able to squeeze this through, even if late. I still think the Academy gave Mrs. Hull the wrong Oscar. How is Veta supporting? That’s a lead performance to my mind. I quibble. The lady deserved recognition so at least the Academy got that part correct. I think your article would have made Josephine Hull very proud. Her performance has a lasting quality that continues to touch us all. “There’s not a loser in the bunch.” Yes, indeed! I must agree with you, Paddy. Hull’s performance IS in the lead category. But I’m so thrilled she got the recognition from AMPAS for her broad comedic performance is hardly matters. For me, Josephine Hull is the highlight of Harvey… if we exclude Harvey itself. I agree that she makes the Pooka believable, and surely deserved her Oscar. 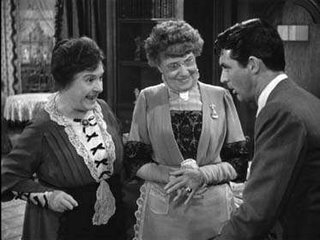 She is great in Arsenic and Old Lace as well, but shines in Harvey. Great post. Loved her in this role. Came across your tribute while searching for public domain pictures of her for IMDb (which hasn’t got a photo of her!). 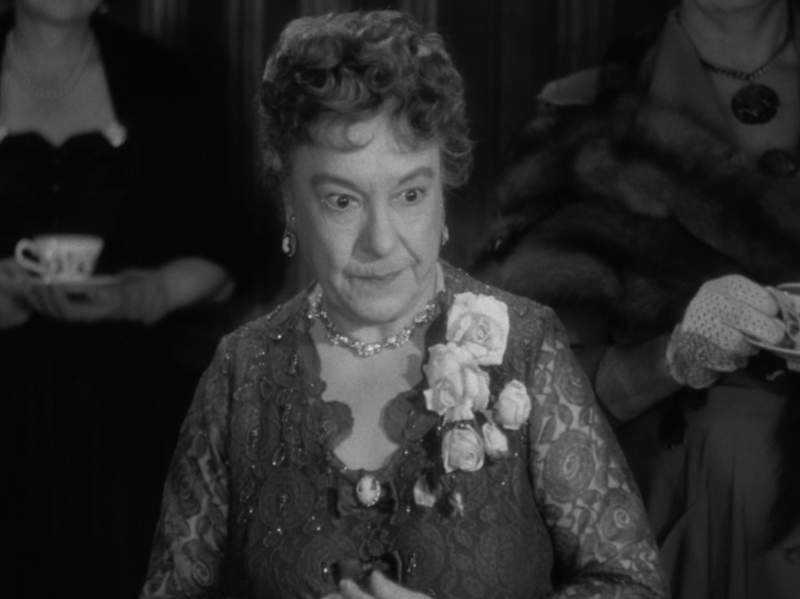 I’ve loved Josephine Hull since childhood (50+ years ago) when I first saw her in Arsenic and Old Lace and then Harvey. I have both flicks on DVD and watch them whenever I need a good laugh. She was truly unique and no one else even remotely captures her dithered, scatterbrained Abby Brewster or Veta Louise Simmons.